This was very cute. At first, I thought it was going to be another book about a tween or teenager yearning after expensive clothing and lots of brand name dropping. It wasn't though. Louise like vintage clothing because of the uniqueness of each individual piece. She doesn't want to shop at the mall and buy a dress that hundreds of other people could also get. She wants to search and find something special and think about what went in to making it and who the person was who wore it first. So it was kind of nice. She wasn't after what was the fanciest of most expensive. Louise cared about the individuality and the story. We do get some vintage clothing history, and learn some names of designers. On board the Titanic (actually, she was really there) was designer Lady Cosmo Duff Gordon. Louise gets to meet her and is very excited since she's read about her. Lady Cosmo Duff Gordon is famous for saying to her secretary, as she watched the boat sink from a lifeboat, "There is your beautiful nightdress gone." Louise has fun wearing beautiful clothing and hats from the early 1900s and having people think she's a movie star, but she learns that really she just wants to be herself. Louise gets off the Titanic safely, don't worry. 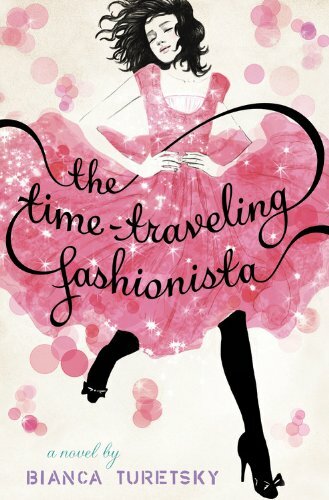 The Time-Traveling Fashionista will be available April 5th. *Fashion-Era.com tells me that "vintage" is anything that is between 20 years to 100 years old. Anything older than that is "antique." If it's more recent than 20 years, it's not vintage yet. This sounds like an awesome means of exploring history through the eyes of a fashion-savvy teenager. :) I've got to check this series out, and thank you so much for the review! I'm so glad you liked it! It was very sweet. What is a Feminist Reader? Nerds Heart YA Nominations Close Today!